Follow that Guide from UVA Magazine on Vimeo. Hundreds of students audition for UVA’s student-run University Guide Service each semester. About 70 advance to the interview round; fewer than half of them become guides. Those who do make it are charged with the tall task of telling the complex story of Grounds, past and present. Each guide is responsible for knowing several hundred pages of information about UVA. Students spend months as probationary guides, attending a weekly three-hour class to learn historical and current information and taking mock tours with more seasoned guides. All guides attend at least two tour-improvement sessions each semester, learning new and updated information. The University Guide Service has long had the reputation of being a very social organization. And it’s true—when 150 outgoing, ebullient students get together to talk about an institution they love, things are bound to get a bit rowdy. 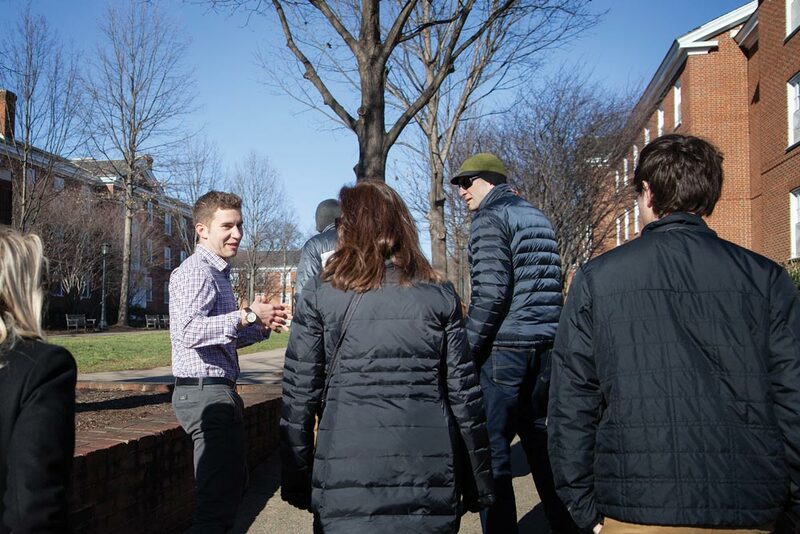 But over the past few years, the group has “redoubled its efforts and focus on giving really, really good tours,” says University Guides chair Mark Heneine (Col ’16). Once the University started looking at its past and present through a more critical lens, the UGuides followed suit. UGuides are prepared to answer any question tossed their way. When difficult questions arise, says guide Charlie Stephens, “it’s important for us to be patient, thoughtful and respectful with our responses, because sometimes people are honestly wondering.” Some of the hardest questions they’ve gotten include one from a parent afraid his son might have a roommate who is gay, and another questioning the racial diversity of professors and students on Grounds. Historical tours previously focused on Thomas Jefferson’s political and architectural accomplishments. Guides now aim to give a more complete view of him, one that lauds his accomplishments while also talking about some of his other choices—such as his ownership of slaves. Plus, adds Heneine, Jefferson may have built the University, but he is just one of the hundreds of people who shaped it over two centuries—people like William and Isabella Gibbons, a husband and wife enslaved by two professors and living in two different pavilions in the mid-19th century. Once emancipated, William Gibbons became a minister at Charlottesville’s First Baptist Church and Isabella Gibbons taught at the Freedmen’s School.